Before starting a career break, we can work with you. We will help you organise the critical, relevant information about you, your skills and experience, to get everything in place. This is key as the information may not be used again for a number of years and until, perhaps, you want to think about returning to work. We can keep in touch with you throughout your break, to touch base, be a sounding board and see how you are enjoying your new venture. You are accumulating worthwhile experience during your break. We can help you develop this into a valuable skills base for the future. 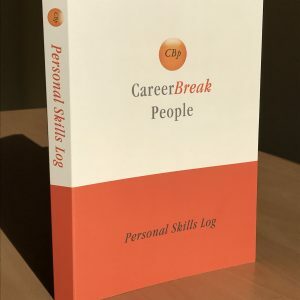 CareerBreak People’s Personal Skills Log contains 11 sections with tailor-made templates for you to complete to help you to organise all your work and experience in one place. 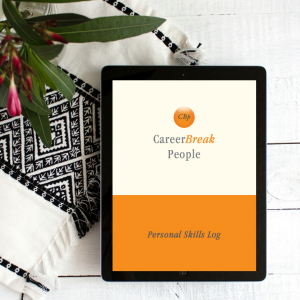 It will help you understand what skills you have gained whilst on a career break, what skills you might want to develop and, if you are about to take a break, how to record and finish off your work before you finish. It is an excellent tool for providing focus for returning to work when the time is right for you. If you would like to use your skills and knowledge to good effect without needing to make an onerous time commitment, have a look at Opportunities.